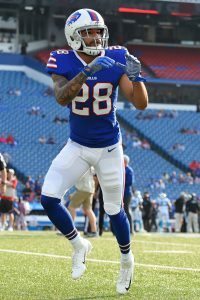 The Browns claimed cornerback Phillip Gaines (from the Bills) and safety Jermaine Whitehead (Packers) off waivers, a source tells Adam Schefter of ESPN.com (on Twitter). If placed on the active roster, both players will be available for Sunday’s game against the Falcons. Cleveland’s been short on secondary personnel recently. Damarious Randall missed Week 9 because of groin and ankle injuries, and E.J. Gaines (concussion) is now on IR. Both Cleveland-bound players have connections to the front office. John Dorsey drafted Gaines in the third round while serving as the Chiefs’ GM in 2014, and Whitehead caught on with the Packers in 2016, when Browns execs Eliot Wolf and Alonzo Highsmith were in Green Bay. Phillip Gaines signed a league-minimum deal with the Bills after four seasons of up-and-down work with the Chiefs. He started in six Buffalo games this season — the most of his career — and made 54 tackles. Whitehead started in two Packers contests and was expected to be a bigger part of Green Bay’s secondary following the Ha Ha Clinton-Dix trade. The former UDFA, however, was ejected from Sunday’s game against the Patriots, further weakening an already-thin safety contingent. He played 221 snaps this season, registered 37 stops and recorded a sack. Says the guy who can’t spell. Has there been even one team during the entire history of the NFL that went injury free and didn’t sign a reject from elsewhere? There has to be more to this Whitehead release that we aren’t hearing about. I know he wasn’t great by any means, but you don’t just cut your starter. You move him to backup first. I don’t think the ejection (which never should have been an ejection) played any part of it either. Agreed. Doesn’t seem like it’d be the penalty either. I wonder what was happening. Greenbay certainly seems to be cleaning house of guys they feel had bad character. He seemed genuinely upset when he got ejected. Maybe he had done conduct issues.